One eye sighting is distinctly slow, and is not adapted to killing game that in the nature of its flight is either imperfectly outlined or rapidly gets beyond range. One eye aiming implies that the instant the gun comes to the shoulder there shall be a pause in its movement while the eye adjusts itself to the sight, or, as it is called, finds it. This focusing the eye upon the sight necessarily dims the vision of the target, for there is no such thing as the human eye focusing perfectly both upon the gun sight and the game. Notwithstanding this the target can be seen, even though it appear shadowy, and the sight may be placed upon it accuratcly; indeed, if the game were not moving, or the shot was directed straight at it, with greater precision than any other way. But it occurs not infrequently that after you have paused to find the sight, the opportunity is gone, either the game cannot be seen again or not quickly enough to covcr it before it escapes. 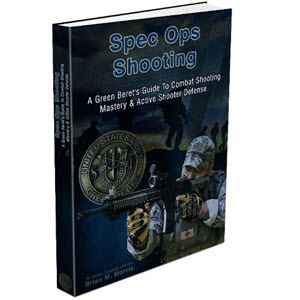 Further, the principle involved in the one eye use of gunsights is that if they do not perfectly align with the target on the first attempt, withhold your fire and never pull trigger until sure of your aim. Naturally this theory of obtaining a second and surer sight when needful is rarely put in practice in wing-shooting, and if it were the result would be a pottering inefficiency that would last through life. The gun-pointing shot doesn't do things that way, since nothing short of a house intervening would prevent his shooting cxactly on time. Finding the sights, whether with one or both eyes open, and putting the focused bead upon the target is beyond question the most accurate way of aiming a gun, as witness that it has been adopted by all riflemen who arc obliged to do fine holding. The very finest sighting that 1 have ever seen done was accomplished with a telescope having a big leather blinder attached to the rear which entirely covered the left eye. thus permitting it to remain wide open without seeing anything. Using a sight of this kind shots can be called within one inch at two hundred vards. This means that at shot-gun range of forty yards, a sighting error of one-fifth of an inch could be detected: the absurdity of such close sighting can be noted by recalling that a shotgun pattern covers at least thirty inchcs at the distance. What is required in wing-shooting is no such hair splitting aim, but that we cover the target with the utmost dispatch and pull on the instant—not a hundredth of a second sooner or later. Indeed, pulling a hundredth of a second too soon or the hundredth of a second too late will make more difference as to where our shot charge lands than any variation that can occur with the finest sight or no sight at all. While I am opposed on principle to the novice learning to sight a shotgun with one eye shut or both eyes open, in fact ro sighting the arm at all, believing that so taught he can never become a first rate performer on all sorts of game, yet I have seen so much excellent work in wildfowl shooting by men who closed one eye or who focused on the sight that I hesitate to say it is not an effective style of firing at ducks or any bird of large size that is habitually outlined against the sky. In shooting of this kind the game is often seen while approaching and allowance can be made for the time required to focus on the sights; neither is it requisite that the gun be handled with such rapidity as in upland work. Success with wildfowl is more due to corrcct estimates of distance and speed of flight than to manner of aiming, and since there is never any question of being able to see the bird, even with half an eye, it is probable that any system of sighting or pointing the gun can be made about equally effective. Two-eye aiming, or binocular shooting, has all the advantages of closing one eye even for rifle firing while a distinctly clearer view of the target is obtained, and distances can be estimated more positively. All of 11s who were taught to close one eye can well remember that the instant we blinded the left eye to find the sight, the bird at oncc appeared to be a great deal farther away. I can recall that more than once when a boy I have shut the left eye and then decided that the quail was out of range, after which I opened both eyes and found it still well within reach. 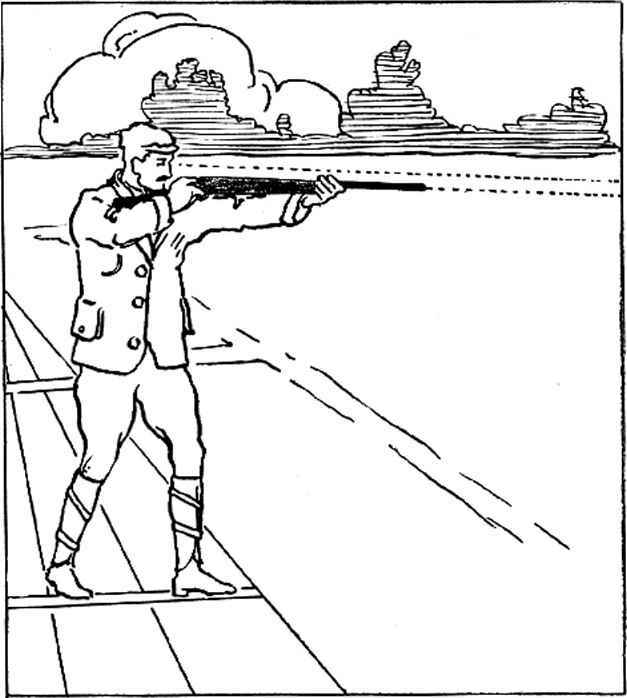 Bimxular shooting, or gun pointing ter work in the style in which he has been trained even though that training were not with a gun. Therefore we can take it as a simple statement of fact that with both eyes open we can the most accurately estimate the distance that game is from us» the speed of its flight, and the lead necessary in order to kill. Moreover we can secure equally as fine sight with both eyes open, cither with shotgun or rifle, provided one eye alone governs the line of sight or is focused upon the sights. This eye is then said to be the master eye for the reason that the brain pays attention to what it is doing only. The other eye sees just the same, but of its vision the brain fails to keep any record. Ordinarily it is supposed that the master eye has the stronger vision, which entitles it to govern, but this does not follow by any means. In shooting from the right shoulder the righc eye controls, not because its strength is greater, but for the simple reason that the brain has been trained to register only what this eye sees. It may be the stronger eye or it may not, and neither would this make much difference unless its vision were extremely defective while that of the other was normal. Ninety-nine times in a hundred one eye governs the line of sight entirely because it has been trained to do this and for no other reason. The usual manner of testing the eyes for shooting is to hold up an object a proper distance from them and align it with a point beyond while keeping both eyes open. Now closc the left eye and if the alignment doesn't change, the right eye governs, but if on shutting the left eye the line of aim swings to the left the wrong optic has been in control, and the student will have to begin training the right eye to assume the mastery or learn to shoot from the left shoulder. Either can be done, but it is much simpler and easier as a rule to put the brain to making its rccords from the proper eye. It might be noted, in passing, that in case of an experienced shot no eye tests are necessary, for the one with w7hich he has been accustomed to sighting is certain to govern.